Why Are Clay Ocarinas So Popular? Many of the businesses that make and sell ocarinas probably started out as a hobby or recreational activity. Jane wanted an ocarina and she decided to try making one for herself... Jane enjoyed making ocarinas so much that she decided to make more to sell and now we have Jane's Handcrafted Ocarinas Business. Ocarinas are ancient instruments and the most ancient of all materials (to make things out of) is clay. So I'd say that many ocarinas are clay since the path of least resistance is to do things the traditional way and make them out of traditional clay. If you want to make your own ocarina or ten, without spending a small fortune, clay is probably your best choice. If you want to buy an ocarina, consider the other materials also. I worked... So hard. I waited so long to be comfortable to buy a new ocarina, finally I buckled down and decided it was time, my old ocarinas weren't as high of quality as I'd like, I got my new ocarina. I took the advice of many of you, I got the standard 12 hole blue Tenor WPN ocarina. I had been playing it... For three months now? And today I had played it. I was practicing "Pollyanna" as sang by Bill Eager. I was going to post my first youtube video and link it from here, for all of you. I was ready! I finished playing and set it on the microfiber cleaning cloth I caringly bought for it yesterday... Now each time I played it I left it clean as a whistle. I decided it was a good idea to clean my room, I cleaned it, nothing happened. Being super careful, I didn't break anything. As I put the shade back on top of the lamp, the aforementioned crown was pushed off and it fell. Everything was slow motion as I scrabled to catch it, to no avail. I heard a gut wrenching *CLINK* and a sound of the crown hitting the floor. I stood still, I couldn't look down. I had felt the ceramic from the impact hit my knees under my shorts. I looked to my left and down, there was the crown. It wasn't the crown's pieces. 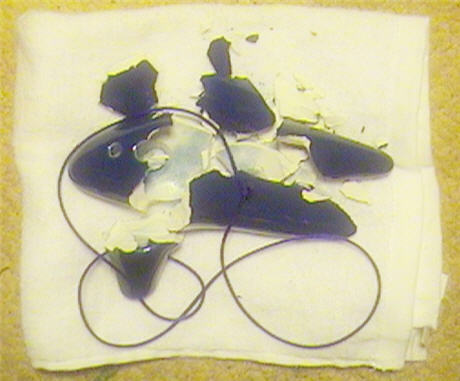 I looked to my feet and my ocarina, my blue tenor, the one I'd worked so hard to be able to get, the one I was going to play for all of you, was shattered. A million pieces, it now resides as naught but a pile of dust and echoes of it's former beauty. I'm crying right now, it's my fault. I wasn't careful and I've broken my one love, I shattered it because of my carelessness and I feel like I'm going to throw up. I haven't cried like this since I saw the short film, "All About My Dog, Marimo." I don't know what else to say. I don't know why I'm showing you all, maybe so you can brace yourself should something so dreadful happen to any of you, God forbid. I feel like I've lost a great friend.